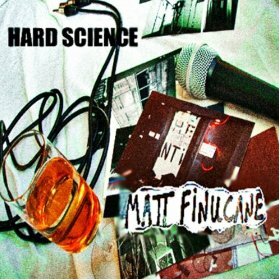 The “Off-beat, art-pop” crooner Matt Finucane‘s latest single, Hard Science, sounds like a mix of both Parallax period Atlas Sound, and Heathen era Bowie, cloaked in a blanket of rasping static-charged buzzes and fuzzed-up guitar effects. An underlaying theme of ‘cooed’ derision and cynicism is levelled at both the science and technology industries’ often cold hard logical conclusions, and at our acceptance of the way we’re being turned from humans into data: “Hard science, encapsulates us/Hard science, involves us/Hard science, sums us up/Hard science, entraps us“. Finucane’s augural warnings loll and ooze over the dark-glam drifting backing, hinting at the seedier, on-message, melodics and structure of Lou Reed. Accompanying Hard Science is the discordant, Hammer House of Horror garage-styled organ, Cast Off Yr Mask. Slightly more sneering, Finucane seethes with contempt at a relationship gone awry; compelling the subject at the centre of his anger to, “Cast off your mask”, and to, “Show me who you really are”. Off-kilter, listing and awkward, Finucane’s constant attempts to smother signs of a melody fail, as this moody, but soulfully grey, song prevails with flickers of a hypnotic tune. Hard Science will be the leading single from the upcoming LP, ‘Glow In The Dark’ – released sometime in July – followed by a Aug/September tour. If these two avant-pop tracks are anything to go by then the album should be, at the least, intriguing.